Bring the Fight in the Streets! Despite our best efforts to contain it, Evil who owned the museum escaped! A vortex pulsating extraterrestrial radiation dominates the streets of our devastated city, while abominations spread in Arkham. 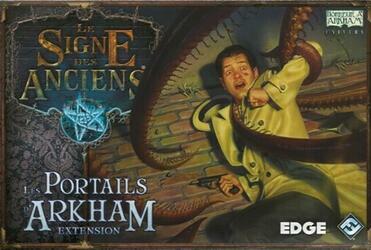 The Arkham Portals expansion offers new and terrifying Great Elders, Monsters and Myth Cards. A challenge at the height of the most experienced investigators! In addition to new allies, spells, and artifacts, which can also be used in the museum compound, new adventures await investigators, this time taking place in the well-known streets of the city of Arkham. As strange portals to other Worlds emerge, the investigators will have to gather all their means to borrow and seal them before Arkham ends up with horror. Be careful this game is an extension of Le Signe des Anciens and cannot be played alone. To be able to play it you must have a copy of the game Le Signe des Anciens .